A lovely picture and yes, the epitome of patience! Thanks for all the quotes, too. Very good food for thought. Thanks so much! I agree… Such wonderful literary reminders to slooooow down sometimes, in this hurried world. Seeing these guys is always such a good reminder, too. now, what a sudden start! His formidable bill has transfixed a perch…. Excerpt from Audubon’s description of a Great Blue Heron patiently poised to catch fish! While spoken of the Great Blue Heron, this patience of the avian fisherman is true of the herons and egrets in general. The stillness is so profound! But, then again the fisherman who uses rod, reel and hook must be patient too!! 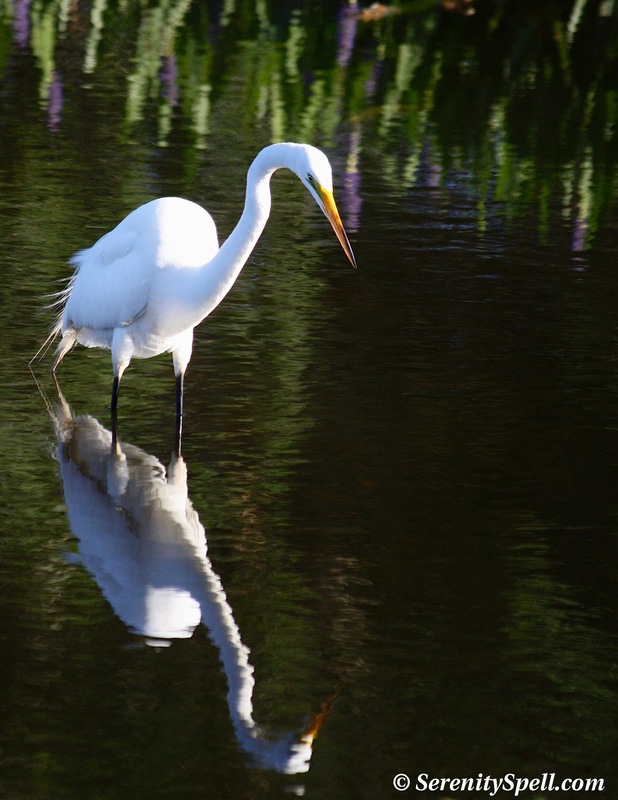 A lovely study of the White Egret with the silky reflections of the purple spires of pickerel weed in the background. I don’t feel very patient about getting back out to the wetlands! I need plenty of work on this attribute. WOW! That Audubon excerpt is just beautiful… Sublimely written!! I especially love the comparison to the “statue of a bird” — when we’re seeing them in the wetlands/swamps, that’s exactly the feeling. He really had a keen eye, a heartfelt intuition with the natural world, and a beaming intelligence to express it. Thanks so much for sharing that piece. It’s been more than a week since I’ve been able to visit ANY of the surrounding natural areas… Maybe nearly 2 weeks? And I’m jumping out of my skin. I’ve made it my mission to go out today, regardless — before the storms, and after my work. I MUST! 🙂 PS — I love how you saw the purple of the pickerel weed in the water’s reflection; that was one of my favorite bits of the image. This is beautiful work! The writing, the ideas, the photo, you can almost feel the soft smooth white feathers, the clear cool water, smell the purple blossoms, really great stuff! Thank you dear girl! I feel more peaceful already! Gorgeous picture – as usual but the quotes on patience are just pages torn from the book of wisdom!!! Thank you.!!! Thanks so much! They’re fantastic reminders, especially in our crazy world. And just watching these birds is a wonderful reminder in itself, really. look who teaches us a great lesson 🙂 wonderful shot. love it. Love your photo – great reflection! I have shared this post and photo on my blog … hope you do not mind. It is so great I felt that I wanted to shout it from the roof tops. Absolutely not — you’re so kind! ♥ I’m very lucky to have the opportunity to watch these embodiments of grace and patience at a moment’s notice. So happy to share!! What an amazing photo! Absolutely beautiful! Thanks so much for sharing!